Minimize risk by performing regular maintenance and performance checks on all equipment to ensure that frequently-used appliances are in good working order. Prevent slips and falls by clearing floors of appliance cords, spilled liquids and properly maintained floor surfaces. Provide an eye-wash station, and maintain an accessible first-aid supply kit. Do not purchase bulk chemicals from companies outside the US (outside FDA control). The resulting infections can be severe. Read the instructions/directions that accompany the various products you use in your salon. Make sure that every employee using that product does the same. If you must re-bottle bulk solutions and chemicals, be sure to label the containers, especially the dispenser bottles. Schedule a check on the cords and plug connectors on your dryers, steamers, etc. once a month. Have a licensed electrician check your appliances and electrical system once a year. If your fuses blow out often, call an electrician. 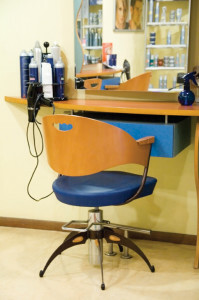 Check with your State Board or the Cosmetology Association to determine if you are covered to offer a particular service or operate a specialized piece of equipment. When considering the purchase of new equipment, insist on a certificate of insurance from the manufacturer. This will protect your business from potential claims if the machine malfunctions. Be sure to clean up all liquid spills (water, lotions, oils, etc.) on the floor immediately. Use caution signs if floor is still wet. Provide non-skid footwear (sandals/booties) to patrons. Wash and wax floors before or after business hours; never when opened for business. Remove wax from floors regularly. Rinse floors completely before applying wax. Avoid excessive buffing on newly waxed floors. Replace broken tiles, worn-out linoleum and damaged wooden floors. Be sure to secure tables (i.e. massage tables/beds) to the floor (i.e. no rollers/wheels on the bottom of the tables). Check all furniture and fixtures every month. Keep them in good repair, tighten loose fittings securely, replacing worn parts when needed. Keep all cords off the floors and clear of the passageways.